Port Blair, Sept. 11: Inspector General MV Pathak, Commander Coast Guard Region (A&N) presided over the Annual Conference of all CG District and Station Commanders to review Operational / Maintenance Philosophy and Infrastructure & Project developments towards the growth of Coast Guard in A&N Islands. The conference was attended by all Coast Guard District/ Station Commanders of the A & N Region including Commanding Officers of Coast Guard Ships and Establishments. 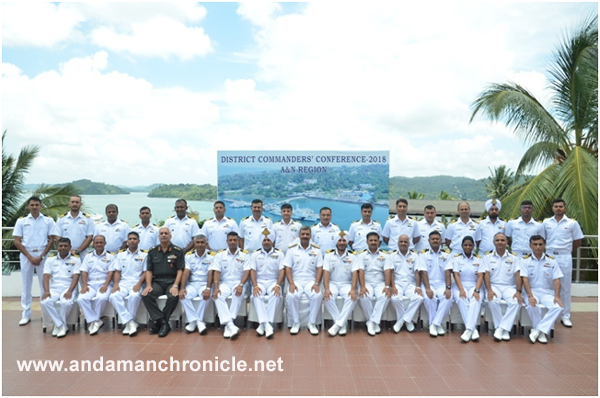 The Commander Coast Guard Region (A&N) in his maiden conference appreciated the solidarity shown by Personnel of Coast Guard towards local population and emphasized that ICG Units should work in tandem with A&N administration for safety, security and welfare of Islanders. The Flag officer asked one and all to put maximum efforts towards attaining requisite goals in a planned manner. The Commander brought out the fact that the Coast Guard Region (A&N) has increased surveillance during last one year and was instrumental in saving 414 lives at sea and 11 medical evacuations. During last one year period, Coast Guard conducted over hundred Community Interaction Programmes towards spreading safety and security awareness amongst fishermen in the remote islands of A&N. He reiterated that numerous exercises conducted by Coast Guard resulted in bridging the gaps in coastal security and would augment our preparedness towards the threats by adversaries. The Flag Officer also reviewed various infrastructure projects being undertaken at remote Islands for improving Coast Guard operations efficiency and reach.